Avebury stone circle, largest in Europe, estimated to be more than 4,000 years old. 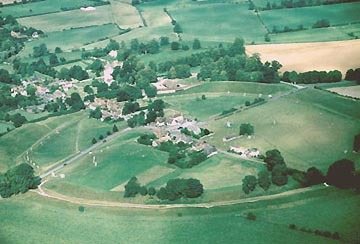 Thirty witnesses at the Red Lion Pub in Avebury, Wiltshire, England, reported a rotating disk hovered about 200 feet above the center of the Avebury stone circle at twilight around 9:45 p.m. on Saturday evening, August 16, 2003. Aerial photograph © 2003 by Bert Janssen. August 20, 2003 - Avebury, Wiltshire, England - Twilight was shifting to darkness at the Red Lion Pub in Avebury when people walking inside the big stone circle began to yell and point toward the sky. About thirty witnesses sitting outside the pub looked toward the shouts. A black and white disk-shaped object was slowly rotating about 200 feet above the center of the Avebury stone circle.